CAPE ELIZABETH, MAINE – One of the first luxury hotels in the United States to accept pets, Inn by the Sea of Cape Elizabeth, Maine, reports a booming success in welcoming canines to their lodging facilities. 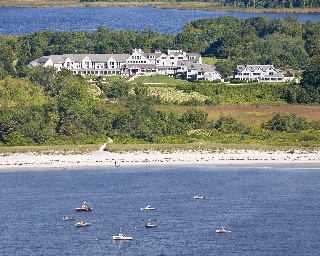 The Inn by the Sea is located in Cumberland County, Maine. Welcoming pets for over 15 years, some of the many accommodations offered include L.L. Bean dog blankets, water bowls, treats, and in-room spa services, including pet massages. Guests staying at Inn by the Sea with their dogs have access to the nearby Crescent Beach, which allows pets on the beach between October 1 and March 31. For a few weeks in October, dogs are also welcome to swim in the outdoor in-ground swimming pool. The Sea Glass restaurant has a doggie menu, and guests are welcome to dine al fresco with their dog on the outdoor patio. In addition to grooming services and pet massages, gourmet pet menus, dog walking and doggie day care are available for canine travelers. The Inn also provides a comprehensive list of nearby walking trails, dog friendly beaches and free-range parks. Nearby, Crescent Beach State Park is closed to dogs completely from April 1 to September 30 due to Piper Plover nesting concerns- – although visitors are welcome to walk on the Park trails, and on the path that parallels the beach, or to go to the trails that go around Great Pond. Voted one of the World’s Best by Travel + Leisure Magazine in 2012, the Inn was also selected as a Top 100 hotel in the United States and Canada by Travel + Leisure readers and was the first and only Virtuoso hotel in the State of Maine.